I recently published a commentary in Yale Climate Connections. An excerpt is below. The full article is available here. Americans watched toward the end of January as winter storm Jayden plunged much of the country (including parts of the Midwest where I live) to record-breaking low temperatures. The extreme cold upended daily life, closed schools and universities, and disrupted mail service in 10 states and air travel around the country. Meanwhile, Australia experienced its hottest January on record. With headlines like the Chicago Tribune’s of a “dangerous deep freeze,” media outlets provided live updates, survival tips, and covered impacts on the homeless, among other angles. Some took President Donald Trump to task over a tweet calling for global warming to “please come back fast.” Media later reported on deaths attributed to the extreme cold, vulnerabilities in public transit systems, and the potentially staggering economic price tag. These are climate change stories. The annual UN climate negotiations, COP24, concluded Saturday in Katowice, Poland with an agreement to bring the much heralded 2015 Paris accord to limit global greenhouse emissions into force. There is a stark disconnect between what would be required for nations to ramp up their climate commitments by 2020 and the lower level of public conversation these climate talks garnered. I attended week one of the talks as an observer participant on the behalf the IECA. If the 2015 Paris climate summit ended with a message of hope and resolve to collectively stem dangerous anthropogenic interference, COP24 underscored the importance of domestic politics for climate policy. The change in national political contexts on the part of not only the United States but also Brazil was fully apparent. The “Yellow Vests,” or “gilets jaunes,” protests that have rocked France, a key player in advancing global climate action, since mid-November also highlight the critical nature of public support for domestic climate policies and that such policies must include mechanisms to blunt their impact. The deal struck in Katowice will require nations to report both their greenhouse gas emissions and progress towards nationally-determined reductions biennially starting in 2024. For a detailed overview of the key outcomes of COP24, check out reporting from the UK-based CarbonBrief. “Urgency” could have been the word of this COP, or perhaps, “disillusionment” with a political process that has enabled decades of delay. The world turned away from binding emissions targets with the failure of the United States to ratify the Kyoto Protocol. Now the emissions gap between what nations are voluntarily pledging to do in terms of emissions reductions and what would be required has caught up with us. One thing that strikes me most from attending this COP is that the UNFCCC climate regime process seems designed to allow countries to collectively push decisions further into the future, such as a question of double-counting carbon credits. Yet, delays are not possible now with the increasingly urgent warnings from climate scientists. Now that the Katowice climate conference has concluded I wanted to see how social media about this year’s round of negotiations stacked up against the 2015 Paris climate talks. In order to answer this question I collected a series of social media conversation streams for the time periods of one day before the start of each COP to one day following their respective conclusion in the data analytic software Crimson Hexagon. Sources I pulled from include: Twitter, YouTube, reddit, blogs, forums, Tumblr and news. Climate change general search terms: #climate, #climatechange, “climate change,” “global warming” and #globalwarming. Excluding: COP21, #COP21, #cop21paris, “conference of parties,” #COP24, COP24, #COP24Katowice, #TalanoaDialogue, #Talanoa4Ambition and #TakeYourSeat. Climate activists search terms: #klimatstrejk, #climatestrike, #keepitintheground, #climatejustice, #climatemarch, #justtransition, #marchCOP24, #climatealarm, #MarszdlaKlimatu, #MarchaPorElClima, #MarcheClimat and #ExtinctionRebellion. 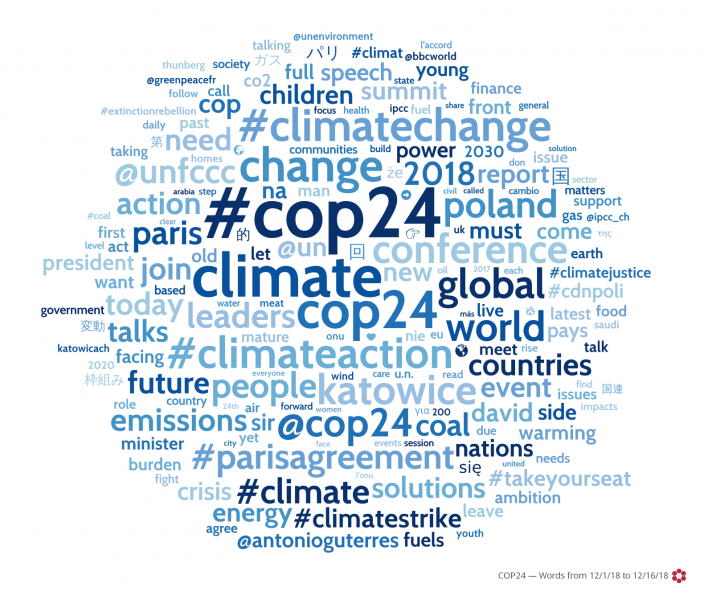 COP24 search terms: #COP24, COP24, #COP24Katowice, #TalanoaDialogue, #Talanoa4Ambition, #TakeYourSeat and #ParisAgreement (2018 only). COP21 search terms: #ParisClimateConference, COP21, #COP21, #cop21paris and #ParisAgreement (2015 only). Search terms for the French “Yellow Vests” protests: “gilets jaunes,” #giletsjaunes and #yellowvests (2018 only). Not surprisingly given that defining the “rulebook” for the Paris accord implementation was technical and revolves around often complicated details, the volume of COP21 posts vastly outnumbered that of COP24. The Paris climate talks garnered more than 4.7 million posts, the majority of which were on Twitter (94%). 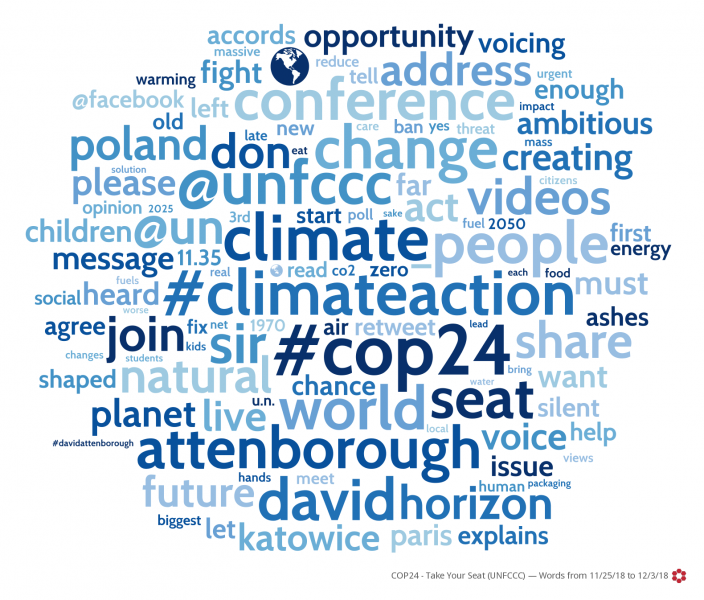 On Twitter the 2015 UN climate conference had a reach of a staggering 47 billion total potential impressions, as calculated by the Crimson Hexagon software. In comparison, the COP24 Katowice climate negotiations were discussed in more than one million posts, far less than three years prior, with a still impressive reach on Twitter of 11 billion potential impressions, though down significantly. In contrast, the most retweeted Twitter post of the Katowice talks was from the BBC (@BBCWorld): “We’re facing a man-made disaster of global scale… time is running out” – Sir David Attenborough issues warning at UN Climate Conference #COP24 in Poland http://bbc.in/2Pd3yfP.” Some of the most retweeted 2018 Twitter posts came from 15-year old Swedish climate activist Greta Thunberg (see here and here), as well as the Dalai Lama. During the Paris climate summit, activists used social media to amplify climate justice and to call for the more ambitious target of limiting global warming to 1.5 degrees Celsius (2.7 degrees Fahrenheit) that was included in the final text of the Paris Agreement. Again with this year’s UN climate negotiations, activists seeking in influence the COP agenda and outcome turned to social media to amplify their messages. During COP24 youth activism for radical tactics took center stage within activist social media with school strike for climate and the Extinction Rebellion movement which got its start earlier this year in the United Kingdom. During COP21, posts mentioning the talks made up nearly two-thirds of conversation as compared to climate change generally. For the more recent climate talks, COP24 made up less than a third of the share of conversation, as compared to climate change generally. For both COPs, climate activists made up 4% of the share of voice. Overall, social media conversation about COP24 was far overshadowed by the French “Yellow Vests,” or “gilets jaunes,” protests. During the time period of COP24, the “Yellow Vests” were mentioned in more than eight million social posts, with a reach of 40 billion potential impressions, as measured by the Crimson Hexagon software. In terms of post volume, this surpasses the 2015 COP21 conversation; rivaling it in terms of reach. With the “Yellow Vests” conversation added in COP24 made up far less of the social media conversation. 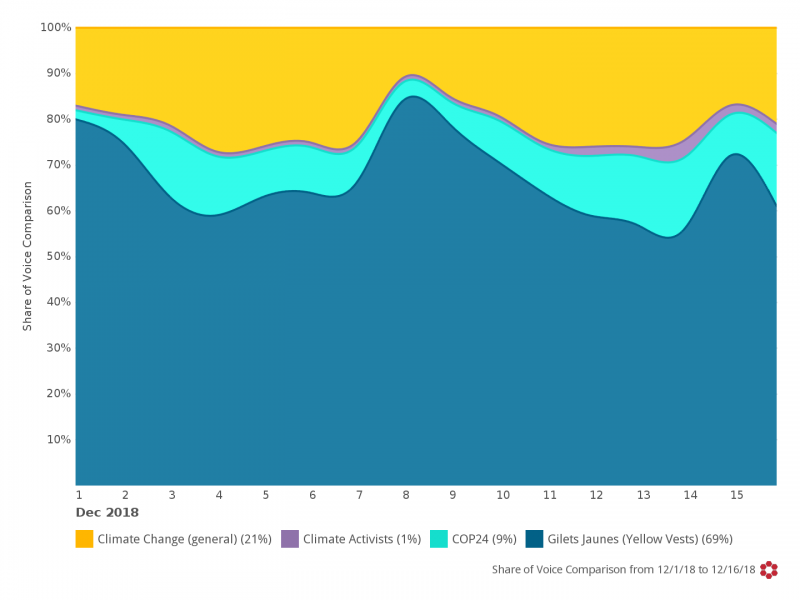 The dominance of the “Yellow Vests” conversation on social media as compared to COP24, climate activists and climate change generally over the time period of the UNFCCC summit can be considered a form of what I term “disruptive social media virality” by individuals who collectively perceive themselves as outsiders to decision-making processes on climate policy and who are directly impacted by these same policies. The “Yellow Vests” movement underscores that energy justice needs to be part of the conversation on climate policy at the national and international levels for lasting systems change. As climate change communicators we need to connect the issues at stake to everyday life in ways that are meaningful. Along with that economic justice as an essential aspect of climate justice has to be part of that dialogue and has to be included in policies for energy sector transformation. This blog post originally appeared on the International Environmental Communication Association’s (IECA) “One Planet Talking” blog. Are Climate Change Negotiations a Way to Engage the World on Climate Change? I am attending the United Nations Framework Convention on Climate Change (UNFCCC) climate change negotiations, COP24, for the first time this week. In UN-lingo “COP24” means this is the 24th Conference of the Parties since 1995 when COP1 was held in Berlin, Germany. The COP24 is taking place in Katowice, Poland from Dec. 2 to 14. It has brought tens of thousands of people, including delegates, or “parties,” along with civil society representatives, to Poland’s Upper Silesia region. As media coverage has already noted, this is Polish coal country, with about 80% of the nation’s electricity coming from that fossil fuel. The major expected policy outcome of this round of international climate negotiations is the “rulebook” for putting the much-heralded 2015 Paris Agreement into practice. As a gathering of heads of state, multinational organizations and civil society, can the UNFCCC and other climate action stakeholders use these arguably esoteric negotiations as a mechanism to engage people in their home countries on climate change? In a cyclical, event-driven news cycle, media coverage of climate issues tends to spike during the annual UN COPs. Media coverage is a pathway to public understanding of what is at stake with climate change as a social, economic and political problem. In this way, the UN gatherings serve to push climate change higher up on public agendas around the world. UN annual climate change conferences like COP24 in Katowice have the potential to help climate campaigners reach beyond core supporters. For context, the first week of the 2015 COP21 Paris climate talks had the potential reach on social media of a staggering 26 billion potential impressions. I have new research out in the open access journal Social Media + Society, co-authored with my colleague Luis Hestres (University of Texas at San Antonio), that shows the UNFCCC used Twitter mostly to discuss procedural matters during COP21 in 2015. As our research in Social Media + Society shows, organizations and individuals who care passionately about climate change are not always effective in choosing visuals that can better engage audiences. Scanning through #precop24 posts on Twitter, generated during two days of preparatory UNFCCC meetings held in Krakow, Poland in October, shows an uninspiring stream of pictures of negotiators in suits. Researchers at the UK-based organization Climate Outreach have found that visuals documenting unfolding negotiations and protests continued to be widespread in media coverage during the COP22, held in Marrakech, Morocco in November 2016. Our research, as well as that from Climate Outreach, points to an underlying challenge for changing the narratives coming out of UN climate conferences. Images from “high-level” sessions, which usually consist of UN officials, along with other dignitaries, and those of protests, provide ready-made content from both traditional media coverage and social media posting. Still, with COP24 underway in Katowice, Poland, it is critical that the UNFCCC, NGOs, industry and others use social media to tell human-centered stories about climate impacts and solutions. One place to locate photographs is in Climate Outreach’s database of images, part of their climate visuals project. In addition, they provide recommendations for visualizing climate solutions, impacts and causes. In the lead-up to COP24 in Katowice, the UNFCCC launched a new initiative for public engagement, the People’s Seat, using the Twitter hashtag #TakeYourSeat to encourage individuals to post their comments and multimedia directed at world leaders and negotiators in advance of the summit. In delivering the official campaign launch address at the opening plenary Monday, followed by a video consisting of crowdsourced material, British broadcaster Sir David Attenborough called for action. “At this crucial moment, the United Nations has invited the world’s people to have their voice heard, by giving them a seat. The People’s Seat; giving everyone the opportunity to join us here today, virtually, and speak directly to you the decision makers,” said Attenborough. In the week before COP24, up to its ceremonial opening Monday, the hashtag #TakeYourSeat, generated 21,625 social media posts, the majority of which were on Twitter. According to the data analytic software Crimson Hexagon these posts had a reach of 220 million potential impressions. Potential impressions is a measure combining the follower counts of social accounts posting on a topic. #TakeYourSeat posts came from 170 countries and territories. The topic five countries for post location were: the United Kingdom (30%), the United States (17%), Australia (7%), Canada (4%) and India (4%). As a measure of the clamour to move beyond talk of climate action, the top hashtags people used along with the official campaign #TakeYourSeat one, include #ExtinctionRebellion, #ClimateStrike and #ZeroCarbon2025. Given the urgency outlined in the IPCC’s latest report on 1.5°C degrees warming, along with the national reports such as the U.S. Fourth National Climate Assessment, climate stakeholders must do better in relating the issues at stake to everyday life for diverse audiences. Climate negotiations present national governments, non-governmental organizations, activists and others with a major opportunity to bring attention to the human scale of climate change impacts happening now and to highlight climate solutions. Now is the time to change the narrative. A little more than a year ago President Trump announced he would pull the country out of the Paris climate accord on limiting global greenhouse gas emissions. It has been a challenging year to teach hope on climate change. What I have learned is that we need to do better at teaching students how to talk about climate impacts and solutions. The emotional labor of teaching on climate change is what I was not prepared for. I taught a brand new undergraduate course on climate change communication at DePaul University in the winter 2018 term. The 17 students in my class were largely there because they cared about climate change but were confused about how to talk about it. There is an urgency to figuring out how to talk about climate change more effectively. Collectively we’ve wasted so much time. Scientists studied the greenhouse effect during the International Geophysical Year — in 1958. That’s right, 60 years ago scientists were working to figure out the impact of carbon dioxide on our global climate. In 1979, an article in the New York Times warned about potential catastrophic effects of melting North Pole ice during the lifetime of someone then in their infancy. Today, ice cover at the poles is at an all-time low. Climate scientist James Hansen, then head of NASA’s Goddard Institute for Space Studies, testified to the Senate Energy and Natural Resources Committee about climate change in 1988. What I was not prepared for standing in front of a university classroom teaching about climate change 30 years later was my students’ anger and confusion at hearing about Dr. Hansen’s Congressional testimony. I could talk at length about the latest social science research on effective climate change communication. The questions I was unprepared for were the ones of why more hasn’t been done. Why have the adults, of which I am now one, and political leaders failed their generation. To put it in perspective, in 1988 when James Hansen spoke to Congress, I myself was a child. Now, 30 years later, we are nowhere where we need to be to address what is essentially the ultimate collective action problem. The Paris accord to limit global greenhouse gas emissions was an important step forward. It is nowhere near enough. This is an important psychological shift that is going on. Projected climate impacts still felt far when I was an undergraduate student in the early 2000’s learning about climate models for 2050. Today, 2050 doesn’t feel all that far off. And, we are experiencing climate impacts which climate scientists have been forecasting for decades. In Illinois, we have already seen increased intensity of rainfall and flooding, along with droughts and rising average temperatures. So the challenge for all of us is to understand how we got here. And, more importantly to understand how do we talk about climate change in a way that matters. In a way that bridges political divisions. Much of the work of climate activist groups is focused on mobilizing the base and stigmatizing the fossil fuel industry. That’s important. But it is not enough. To foster hope on climate change we need to also open a dialogue. Political ideology is a primary predictor of climate change beliefs. To teach climate hope we need to understand the emotions that our changing environment sparks in students of all ages. Anger and fear are disempowering. We need to teach about climate solutions without sugarcoating the challenges. Where we can find renewed hope on climate change is in talking about what we love that is impacted by climate change, as well as understanding how individuals come to their beliefs about global warming. Let’s start with what we can agree on. In my teaching I emphasize that the majority of people in the United States are potentially reachable on climate issues. In fact, less than one in 10 U.S. adults are actively dismissive, according to research from George Mason and Yale Universities. What’s more, even a majority of Republicans support increased research funding for clean energy technology, teaching climate change impacts and solutions in schools and that the country should use more solar and wind energy. What we need to do is change the narrative about who supports climate action in the United States. We need to talk about climate change in a way that connects to everyday lived experience. In a new handbook for IPCC scientists, the UK-based charity Climate Outreach recommends telling human stories and speaking to shared values. At the end of my course, one of my students reflected on seeing Al Gore’s An Inconvenient Sequel: Truth to Power at a local environmental film festival. The student wrote about how the film had sparked a conversation with his partner, who he described as doubtful, about climate change. These are kinds of conversations we all need to be having. We need to talk more with those who don’t agree with us. We need to open dialogue on finding common ground, rather than the politics of climate change that may divide us. That is a way to find hope on climate issues. Teaching climate hope is hard. It matters more now than ever. This blog post originally appeared on Medium.com. I am giving a presentation on climate change communication for the Archdiocese of Chicago’s Office of Human Dignity and Solidarity on Wednesday. The event description, my slides and links to additional resources are below. “Join the Office of Human Dignity and Solidarity on Wednesday, June 6 from 11 a.m. to 1 p.m. as we answer Pope Francis’ call to ‘each person on this living planet’ to care for our common home. Because everyone’s home is different, creating effective campaigns around this initiative can be challenging. Wednesday, June 6, 11:00 a.m. – 1:00 p.m.